Does Floyd even have a sidewalk clearing ordinance? 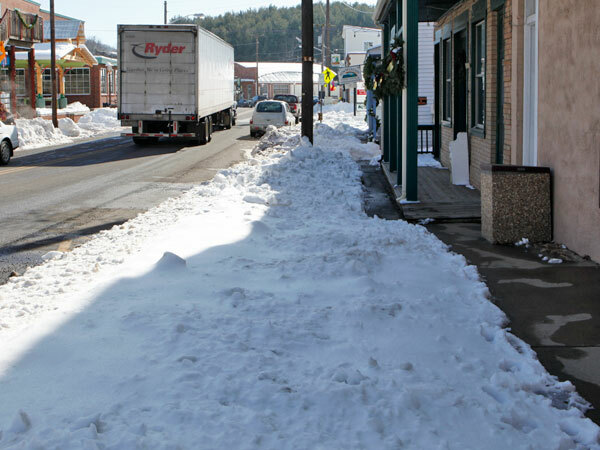 Question of the day: Does the town of Floyd have an ordinance specifying if, when and how a sidewalk must be cleared in front of a business or residence? I’ve asked the question in the past and have yet to get a clear ordinance on what, if anything, is in the town ordinances regarding who is responsible for keeping a sidewalk clear and what penalties, if any, are imposed for those who don’t. When snow strikes, sidewalk clearing is, shall we say, haphazard. Some clear their sidewalks right away. Others carve a narrow path and still others do nothing. Paths on sidewalks can end in a pile of snow blocking further progress. Walking in Floyd this week could be tense because in many places, those trying to get from one place to the other by foot had to share the road with motorists and pedestrians learned long ago that some drivers don’t play well with others. Some municipalities have strict ordinances requiring prompt removal of snow from sidewalks in front of property. Washington, DC, for example, requires removal within 8 eight hours on the first day following a storm. Blacksburg requires removal of snow or ice from a sidewalk within 24 hours. As soon as feasible, clear snow off the sidewalks in front of their property so that all pedestrians, especially school children, those with disabilities, and the elderly, may walk securely. So what’s the answer for Floyd? Beats the heck out of us. Bill and I walked one mile plus to town last Sat to clear the side walk in front of our store and with help from our kids did a decent job. 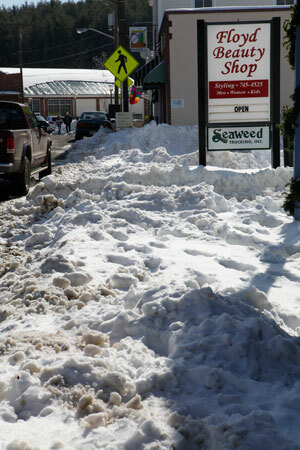 then paid to get the snow out of the parking spaces in front of the store, thanks to Oddfella’s and Floyd Antiques. Our part of town looks great. Customers definately appreciated it and it is a lot safer than walking the road. If our three businesses could do it, seems like others could too, by now. It is a lot of snow, but it is not impossible. The answer is just do it. I was the operator in the Bobcat helping Kerry out, and was going to do more sidewalk clearing, but there were several things that pulled me out of town. during the clearing of the street and sidewalk in front of the building, I had someone come up and start arguing with me as to where the snow should go, and to be honest, my parking lot had not even been done at that time. I was not going to get into an argument over a snowpile, so I headed back to my shop. There were quite a few people that were helped out on Sat and Sun by many people, but there is always one person to be a pain and negate any attempts one can make at helping out their neighbor. Merchants have a natural motivation to make sure customers can reach their shops. Tenants have a natural motivation to rent from property managers that maintain their residences. Resident property owners have a natural motivation to make sure they can get in and out of their property, and that they have good relations with their neighbors. If this doesn’t clean the sidewalks fast enough for someone’s satisfaction, why not consider non-violent means to make the world suit their vision for it? Charitable funds, insurance, doing the neighbor a favor, an industrious kid with a snow shovel knocking on doors–there are all sorts of ways to solve this problem without having to resort to threatening townsfolk with fines and other confiscations if they don’t live their lives according to someone else’s standards. May everyone have a Merry Christmas, and may we always remember to consider peaceful solutions first. Mark, it isn’t living your life to everyone else’s standards but making it safe for pedestrians to walk and not have to walk in the road. When you get to the point where clearings are ‘owned’ by virtue of the odd lawn chair or other bit of furniture, you will have arrived at snow removal standards, most high. In Chicago, cleared parking places are claimed using these oddments as placer claim stakes, with the system being annually deplored by the slick suits in City Hall, while the claimants risk loss of the furniture bits, without legal penalty imposed by the police. The problem here is that snow may be cleared, but ice remains, which leads to many injuries due to slip sliding away on the glazed sidewalks. At least, when relatively fresh, snow offers some grip for the boots. Good luck figuring out exactly what the regulations require. No one of sane mind or memory can do it even where the code is clear. Of course, a clear code does not always mean a clear walkway. If safety is important to pedestrians, than shouldn’t they bear the responsibility to either clear the snow away or wait until it melts? Why should we threaten other people for the sake of pedestrians? It’s not as if property owners undertook some action that put pedestrians at harm. Even lawyers would refer to the snowfall as “an act of God”. Shouldn’t we be a little understanding if some property owners are not able to deal with such an extraordinarily large snowfall as quickly as might suit pedestrians? Should we really try to use this snowfall as another excuse to threaten people? I assume that those who complain about the snow are concerned for others. They worry about how the elderly might slip and hurt themselves, or how people may have to walk in the road at a time when cars are slipping and sliding. There is nothing wrong with these concerns, and it is admirable that people are trying to solve the problems that others may face. It is the next step that troubles me–we have been taught to jump too quickly to the conclusion that “there oughtta be a law”. Every law is either enforced or it was a waste of time and money to create. If a law is enforced, we are asking our sheriff to use his armed officers to make people comply with the law. People are generally frightened of an armed conflict, so they will submit to the officers, or even submit to a letter from courthouse suggesting that officers will be used. More than this, all of the government activity of creating and enforcing laws is paid for by threatening to confiscate our land if we do not support it. It is a system based on violence. Maybe this system is too big for us to fight on some issues. Maybe it is too scary to suggest that all of the armored vehicles, surveillance, asset forfeitures, and no-knock raids be dismantled for something as big as the War on Drugs. But we are talking about a snowfall here! An act of God that occurs every few years and turns Doug’s car into a work of art! Do we really need a law to deal with this? Floyd does have a snow removal ordinance (as noted elsewhere on this site today). It states that property owners must clear sidewalks of snow within 24 hours of a snowfall. The snow ended Saturday morning, which meant the sidewalks should have been cleared by Sunday morning. Obviously, a lot of property owners in Floyd violated that ordinance. So did the the Government of the Town of Floyd, something Mayor-Elect Will Griffin admits. Also, the Floyd County Sheriff’s Department does not enforce the Floyd Town ordinances. That role belongs to the Town Constable (a position that has been unfilled for years) and for a part-time officer who works Friday nights and Saturdays. The penalty for violating the snow ordinance is a fine, not arrest, so the threat of conflict with an “armed officer” is a stretch that really has no bearing on this issue. So, there is no consequence if you refuse to pay any fine to the town–you will never be arrested and brought to court? This means the ordinance is doubly unenforced–no further action is planned if you ignore the fine, and there is no enforcement officer. It is a toothless piece of legislation that was a waste of legislator time and taxpayer money to implement. I suspect that there really is a method for the town to collect outstanding fines. And unless the person who is fined submits to this method, force is used. Otherwise, it is not a fine, it is a request. There is an event with less than perfect resolution: The biggest snowstorm of several years is not immediately cleaned! The well-intentioned worry about the consequences: Think of the danger! What about the elderly?! What about the children?! The utopian promise of government rears its ugly head: If only someone made a law to punish people, the snow would have been taken care of immediately! Officials are accused: Why didn’t you make sure there was a law against this ugly situation?! Why didn’t you enforce the law that was there?! Officials have to take swift action to appease the voters: More laws! More enforcers! But now that we have sunk money into more laws and enforcement we need to make sure they are used: The newly appointed Town Constable searches out all outstanding fines to be collected! Now our officials satisfy the calls for a perfect world even easier: It’s so much easier to make laws and impose fines now that we have a Town Constable! Property owners work harder to avoid all the fines: They block off all pedestrian traffic that isn’t mandated! They can’t afford to be liable for such draconian snow-clearing laws! Society seems to be breaking down: Pass more laws to force people to be good! Unless you stop and question whether government really can be used to create a perfect world, the system of violence and authority grows and grows. It’s certainly a matter of perspective. I wonder how many tuned in for Shock and Awe with cheers for blowing up much more permanent infrastructure or a nation of civilians to prove a point to a government? It’s more than obvious from the photos that willing and able snow shovelers have no place to dispose of the unusual amounts from this storm. A snowblower could blow it into the road and the snowplows can shove it back. The weak and feeble should just stay home and think about thaw and melt. I’m happy this will take care of itself, unlike the thoughtless litter generated by folks that have a clear path to shopping.